The 2013-14 winter season was disappointing with respect to snow. Essentially there was none. Yes, we did have about 4 lovely weekends with a foot or so of snow, but after falling, it promptly melted away and percolated onto the soils of our beloved Mt. Pinos. Despite the limited snow, the Mount Pinos Nordic Ski Patrol managed several big accomplishments. Below is a recap of a few of these. Each year, prior to the onset of the new winter season, the Mt. Pinos Nordic Ski Patrol has an on-the-hill refresher training. Usually this is a day-long event with 8-10 stations where the patrollers demonstrate and refresh their proficiency in various skills. 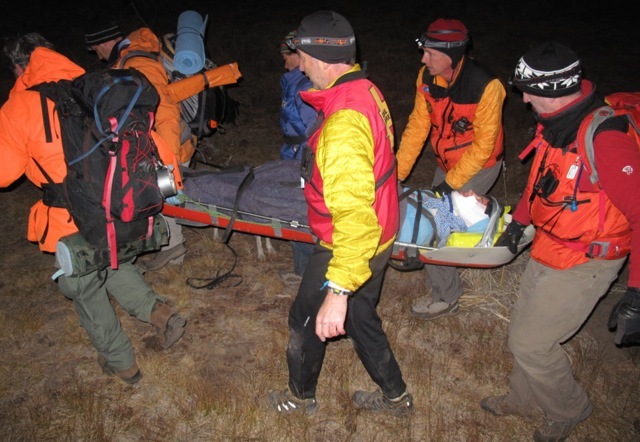 In August 2013, in preparation for the 2013-14 season, the planners of the event decided to take it over the top by organizing a mass casualty training scenario and invited patrollers from Mammoth Basin Nordic Backcountry Patrol and California Winter Search and Rescue Team – South to participate. The event also involved 17 “patients” from two local Boy Scout Troops, a professional make-up artist, personnel responsible for feeding and hydrating all participants and 10 evaluators from a variety of Patrols in the Southern California Region to monitor the exercise and ensure the safety of all participants. The old trail map created in the early 1990s and released in 1992 is now out of print and the Patrol members diligently worked on creating a new map. The updated map was tested and is being readied for release to the public in the 2014-15 season. Mt. Pinos partnered with Mammoth Basin Nordic Ski Patrol in providing a training program for 6 candidates. All performed exceptionally well and everyone is hopeful for snow to complete the training in the 2014-15 season. Unfortunately, the Candidate program could not be completed last season without snow—skiing, toboggan handling and sleeping in a snow cave built by the candidates will be done in the upcoming season. If interested in becoming a Nordic (Backcountry) Patroller, send an email to . A new Outdoor Emergency Care (OEC) class is being scheduled to start in late August 2014. This course and certification is an essential requirement in becoming a NSP Patroller. With no snow, Patrolling was not possible most weekends in the 2013-14 season. The patrol leadership decided to use this as an opportunity to focus on training each scheduled patrol weekend and the “Team Leads” selected appropriate training topics including OEC (first aid) skills, navigation, rope work and rescue techniques. In May 2014, the patrol, again in partnership with Mammoth Basin Nordic Backcountry Ski Patrol developed an OEC Enhancement seminar where Patrollers were able to practice their OEC skills. The Patrol decided to do things differently this year. Instead of the patrol recognizing its nominees for the annual region awards with a certificate, the patrol thought a more tangible recognition was in order for the outstanding members of the Mt. Pinos Nordic Ski Patrol. 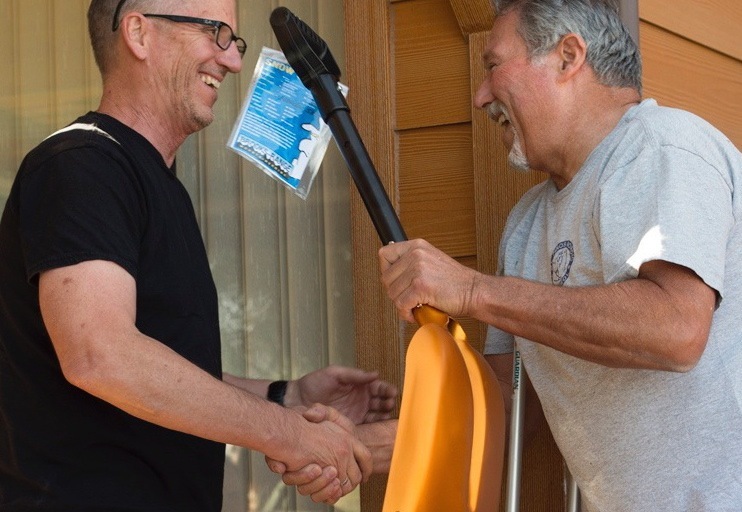 Instead of a plaque or trophy, 8 members of the patrol were presented with engraved “avalanche shovels".